I think breads that are leavened with a wild yeast have a much more complex flavor profile than breads that just use commercial yeast. You also get a bread that is entirely unique to you. This is because a levain that is from my home will be different than the one in yours, depending on the good bacteria and yeast that thrive in our homes. It is said that if you were to take a bit of the famed San Francisco sourdough mother to your own house it would change within a matter of weeks to your own flora. This is not a bad thing, but it does make it hard to replicate some breads. In my opinion it is worth taking the time to culture and maintain your own levain. It is really only the culturing that takes some time and patience, because once you get it up and going it is very easy to maintain. I think some people have been scared off because some instructions require daily feedings with large amounts of flour and water, but really I just haven’t found this to be necessary. I keep mine in the refrigerator when I am not baking with it and if you can remember to take it out and feed it just once a week then you will always have a healthy levain to bake with. Combine the ingredients together in a large Mason jar and close the lid without the gasket in place. (I like the jars with the rubber gasket and the locking lid) Leave at room temperature. If you remember, it is a good idea to stir up your levain once or twice throughout the day. Yeast like oxygen for healthy growth. Discard two thirds of your levain then add in the water and stir well to break up the levain and to also add in some oxygen. Then add in your flour and mix well until no dry flour remains. Once again close the lid without the gasket and leave on the countertop stirring once or twice throughout the day. Discard two thirds of your levain then add in the water and stir well to break up the levain and to also add in some oxygen. Now you need to remove the remnants of the raisins that were added on the first day. I do this by pouring the watered down levain through a mesh strainer into a bowl. Pour your now raisin free levain back into your jar and add your flour. Once again close the lid without the gasket and leave on the countertop stirring once or twice throughout the day. Today you should see bubbles breaking on the surface of your levain and you should also see some small bubbles if you view your levain from the side. You should be able to smell a hint of a yeasty aroma from your levain. Continue with the discarding, feeding, and stirring. Each day you should notice more growth (like dough rising) and a slightly stronger smell (slightly sweet and yeasty, with a slight back note of sour). It should never smell very bad or overly strong. If it does I recommend discarding all but a tablespoon and feed it again making sure to incorporate more oxygen into it. 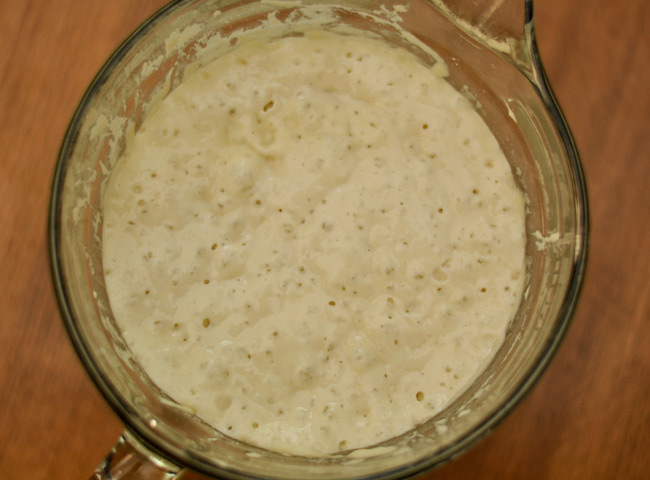 If your levain hasn’t changed at all in 7 days then it is time to scrap it and start again. Sometimes something kills either the necessary bacteria or the fragile yeast. If this does happen try using a different batch of flour and/or water and see if that makes a difference. By day seven your levain should be strong enough to rise a loaf of bread. Feed your levain the night before or at least 2 hours before you plan on making your dough. This will ensure that your levain is ready and active enough to do the hard work of leavening your bread. I store mine in the refrigerator throughout the week. Right after I use it in a recipe I feed it and then put it right back into the refrigerator. I try to remember at least once during the week to give it a feeding of equal parts water and flour (by weight). It really isn’t as fragile as most people think it is so don’t panic if it has been three weeks since it was last refreshed. Just take it out of the refrigerator, scoop out most of the old levain and replenish it with flour and water. It will take probably a feeding or two before it gets nice and active again. I have followed this procedure (but with 50g of flour at a time), and the fourth day the paste began to triple in 8 hours or so. So it worked! I have been feeding it 2-3 times a day ever since for one week, but the first bread, a ciabatta, came out a tad too acid, and with a compact crumb. I guess I need to feed the levain at room temperature some longer before it is ready to bake. Hi, I’m just curious, do you ever bake with what you discard during the culturing process? I don’t bake with what I discard, but you certainly can if you want to add a sour note to your baked goods. It will not be the best for helping with the rise of your dough though. Your website is great. My boys and I are in our fifth day making the levain. Looking forward to trying it on Sunday evening. Could you please tell me how much Levain does one use for a 1 lb loaf? Could you also please tell me, if I’m taking out that quantity of levain each week, is it still ok to just feed it on the off day of the week? Thanks a lot for all the work on this great website. 1) Take it out once a week and discard half and feed it with 130 gram of flour and 130 grams of water. Let it sit out for an hour on the counter than put it back in the refrigerator if you don’t plan on baking with it that week. 2) If you plan on baking with it and it has been fed regularly once a week, then you can remove it from the fridge, discard half and replenish with 130 grams flour, 130 grams water. Let it sit at room temperature for 4-8 hours until it has bubbled up and seems alive again. I would then go and discard 1/2 again and re-feed. This will give you the strongest starter for your breads. So I guess I would say that it is best to remove your starter the day before you plan on baking or at the very least very early in the morning. Hi There, i have a question about the discarded dough. what can i do about it ?? It seem to be a wastage. There really isn’t too much that you can do with the waste. Sometimes I will use the discard amount as just a flavor component to my breads, you will need to add some commercial yeast to these breads as the starter will not be powerful enough to raise your dough sufficiently. If you are not using starter too often once it is matured then you can just cut back the amount you make and keep it in the fridge so it is dormant. When storing levain in the fridge, should it be tightly or loosely covered? You should cover it loosely. It will still expand, although more slowly, and you will want the gases to be able to escape. I use a canning jar that has the latch lid and just don’t use the gasket that it come with. Hope that helps! Thanks!